Remember living in your first apartment? For many of us it was a small, cramped box. Here’s an apartment to beat all of the other little boxes out there. 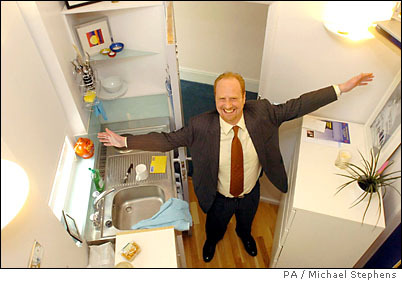 Welcome to London, home of possibly the smallest apartment in the world. This 62 square foot flat has all the necessities that $247 a week can buy: a platform bed, bath, wardrobe, and kitchenette (if you can call it that). $247 a week is a lot of money! For this kind of money, you can find a much more spacious space with a friend in Canada. Have you seen the apartments in Asia? They’re small but much better designed. Is this the new condo we’ll see in the future? Amazing. It reminds me of a sleeper car on a train, although, of course, there would be no kitchenette. Perhaps it is more like a miniature mobile home. I don’t think I have ever seen pictures of an apartment quite this small — with kitchenette and bath — and I have seen quite a few of the new “micro” apartments. I must say it’s a bit cozy. Were it in a prime area of a city I really liked and I could save a lot of money on rent, I would go for it!